Our main objective is the development of cooperation and enviromental protection projects. • Reduce the volume of clothing that goes to waste treatment facilities. • Reuse the majority of clothing that's discarded. • Recycle clothes that are in bad shape so that they can be transformed into other products. We collect used clothing and shoes in 5,000 containers throughout the regions of Andalusia, Asturias, Castilla La Mancha, Castilla y León, Cataluña, Comunidad Valenciana, Extremadura, Galicia, Madrid, Islas Baleares, Navarra and La Rioja. Every year, we collected approximately 18,000 tons of clothing and footwear. We sort the clothing that's been placed in the containers. We currently have three sorting centers in: L'Ametlla del Vallès (Barcelona), Leganés (Madrid) and Valderrubio (Granada). Clothes that cannot be classified are sold directly to textile recycling companies. 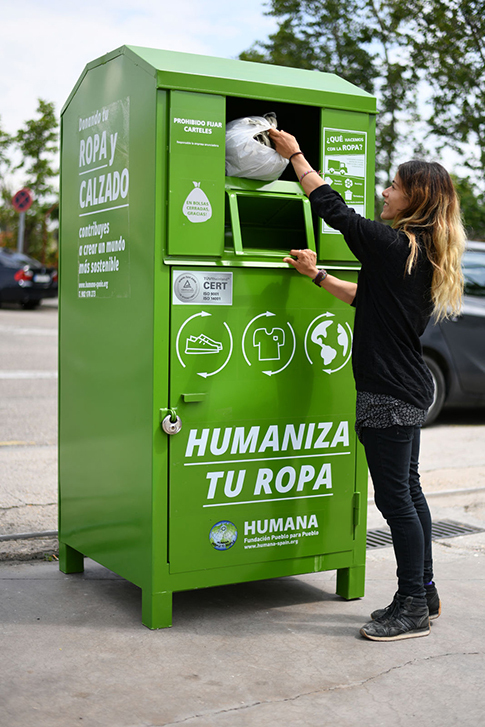 • 15% of classified clothing goes to secondhand stores that Humana has in Spain. • 46% of the classified clothing is sent to Africa to be sold at low prices to local merchants. This meets the demand of the countries, creates local economic activity, and generates local resources for development. • Approximately 29% of the collected clothing cannot be reused as a garment and is therefore sold to textile recyclers. • The remaining 10% is sent to waste treatment facilities, as it cannot be reused or recycled due to its quality. Want to visit one of our sorting centers? Earmarking the proceeds for cooperation projects. With the funding generated from the clothing, we fund international cooperation projects in areas such as education, health, social integration, agriculture and rural development, and community development, among others. These projects are in Africa (Angola, the Democratic Republic of the Congo, Mozambique, Guinea-Bissau, Namibia, Zambia, and Zimbabwe), America (Belize, Brazil, and Ecuador), and Asia (India, China and Laos). Want to know more about Humana's cooperation projects?